Costco‘s (NASDAQ:COST) 2018 performance has been mostly above its guidance and market expectations. Costco has had a productive year so far, with 8% and 10% gains in same-store sales in the quarters ending February and May, respectively. In addition, the company has continued to add members, while maintaining a retention rate of around 90% over this period. This is significant because Costco relies heavily on its membership fees, despite the fact that these fees account for only 2% of the company’s total revenues. The company’s membership fees contribute around 17% of its total value, per our estimates, given the low costs associated with the revenue stream. Like other large retailers, Costco makes small margins on most of its items in its stores, and the membership fees help offset these low margins. Paid memberships at Costco have grown at a CAGR (compounded annual growth rate) of 5.2% over the past two years to 49.4 million in fiscal 2017 ended September 2017. We forecast the company’s revenue from membership fees to grow at a similar rate in fiscal 2018 as well. Overall, the retailer’s continued growth momentum confirms that it should be able to continue to see healthy traffic at its brick and mortar warehouses despite stiff competition in the grocery sector in the long run. Accordingly, we expect Costco’s revenue to grow by nearly $15 billion (5% CAGR) through 2019. 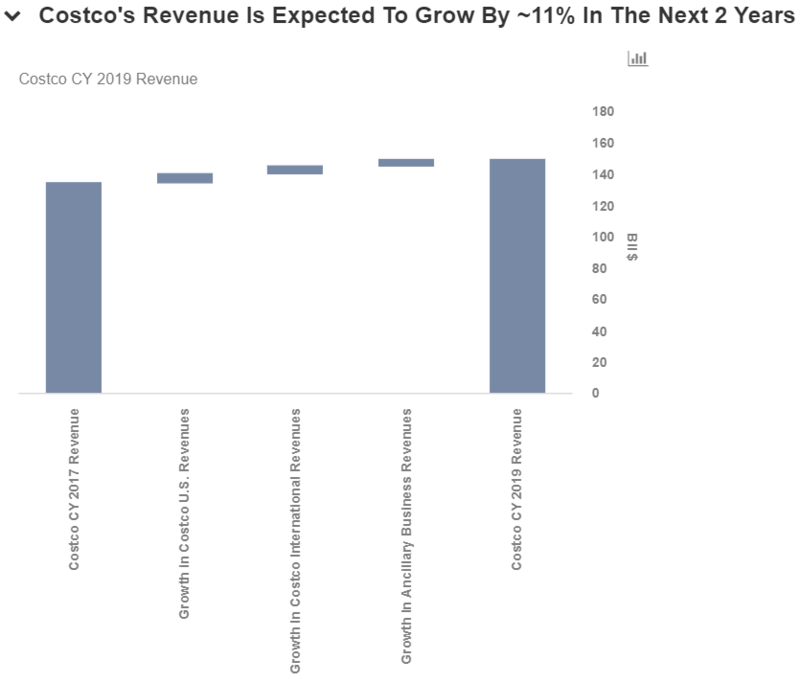 To arrive at our 2019 net revenue estimates for Costco, we have broken down the revenues and estimated separately. We have also created an interactive dashboard analysis which provides a detailed analysis of how to arrive at this growth number. You can make changes to these variables to arrive at your own revenues estimates for the company. We have a $212 price estimate for Costco, which is slightly below the current market price. Costco saw its stock gain nearly 15% in 2017, and is now up more than 20% year-to-date. Much of the stock increase is due to the company’s strong growth in comparable sales in the U.S. and other international markets. Going forward, we expect the company to grow at a similar pace as that of 2017, as it continues to invest in its people and technology. The biggest positive takeaway from the Costco’s growth story is the increase in its domestic comparable sales. The company’s U.S. comparable sales growth jumped to 10% in July 2018 from 6% in July 2017. Costco’s organic performance has been keeping pace with the U.S. retail industry, in large part due to its business model. Costco has also been able to grow its e-commerce comparable sales gradually from 26% in August 2017 to 43% in May 2018. 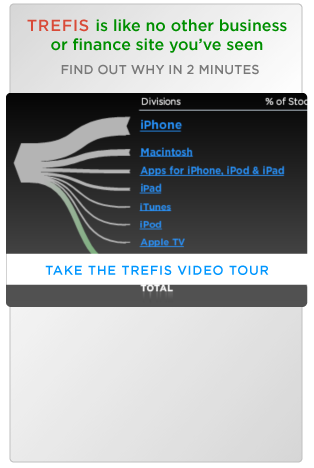 However, the online comparable sales came down to 21% in July. The retailer is driving online sales with ongoing site improvements, improved online marketing activities, and distinct products and services. The retailer also rolled out two online delivery related offerings on dry and fresh grocery. However, it should be noted that Costco’s model works on thin margins and large volumes, and therefore the company is not keen on selling smaller quantities online. The fact that Costco has been able to grow its revenues and comparable sales with its model, without a strong focus on e-commerce, suggests that Costco is likely to be the least affected retailer in the Amazon-dominated retail industry going forward. We have calculated Costco’s total revenue by estimating the revenues from the company’s domestic sales, international sales, ancillary sales and membership income. We expect Costco’s 2019 store count in the U.S. to be around 540, with an average square footage per store of 148k and revenue per square foot of $1060, translating into $85 billion (+3% y-o-y) in domestic revenues in 2019. In addition, we also expect close to 250 stores in international markets with an average square footage per store of 145k and revenue per square foot of $967, translating into $35 billion (+8% y-o-y) in international revenues in the same period. On similar lines, we expect Costco’s ancillary revenues to reach $26 billion (+9% y-o-y) in 2019, with 771 warehouse clubs and $34 million in revenue per square foot.